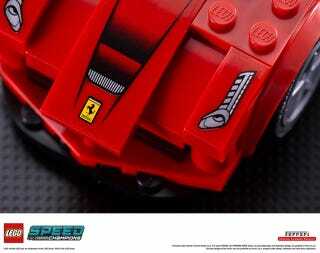 Lego has finally confirmed the partnership with Ferrari, Porsche and McLaren in a new theme called Speed Champions that will launch in March of 2015. Seven new sets will be available in the line and all of them are awesome. Seven different LEGO sets will be available from spring 2015, ensuring lots of racing action and squealing tyres in the children's room. A large red Ferrari truck drives up – together with the Ferrari F14 T Racing car.What's more, a McLaren Mercedes pit stop set will also be available, featuring the McLaren Mercedes MP4-29 as well as the home stretch with lights function and two Porsche cars – the 911 RSR and 911 GT3 R Hybrid. Also four sets of stand-alone vehicles wait to hit the track. Whether it is a racing car or road car – the new brick built car models will get the hearts of five- to eleven-year old as well as grown up engine fans beating faster. In addition to typical LEGO building fun, the LEGO Speed Champions series of vehicles is particularly amazing thanks to its many authentic details: the LEGO minifigures are wearing racing car overalls, there is a winner's cup, flags and detailed tools – inspired by their big role models Ferrari, McLaren and Porsche whether you are a passionate builder or a keen car fan, there is an exciting offer. Now just one question remains: Who will be the Speed Champion in 2015? Images of all 7 sets are available in our post from early last month.